The OLD Big Dead Sidebar: That's No Gouda! For most of the year, the Chicago Cubs have been giving their fans a different type of road rage, entering the series with Milwaukee a whopping eight games under .500 away from the Friendly Confines of Wrigley Field. After beating the Brew Crew on a night where CC Sabathia started, the Cubs followed with a sixth inning base-hit barrage against All-Star Ben Sheets to extend their lead to three games. Now the question is: can a pair of wins two hours north of Wrigleyville propel the North Siders for the rest of the season? After the CC trade, when he still had periods in his name, everyone seemingly wanted to crown the Crew and brush off the cursed Cubbies. And while the Brewers have been the hottest team in the league since the All-Star break, erasing a five game deficit to tie the Cubs for the division lead July 26, the North Side Nine have rebounded in Milwaukee at the expense of the beer makers. It might be back to the drawing board for Ned Yost. The Brewers' team 'D' looks porous as Swiss cheese. Monday night, it was Rickie Weeks turning an inning ending double play into a two-run fielders choice. Tuesday night, Ryan Braun and Corey Hart made Manny Ramirez look like a Gold Glover turning singles by Kosuke Fukudome and Ryan Theriot into triples. Even the slick-fielding shortstop J.J. Hardy spun his wheels and was unable to stop a weak grounder by Mark DeRosa from turning into a line drive RBI single in the box score. 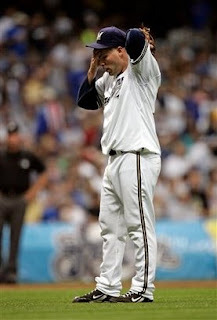 If not for the efforts of three-time Gold Glove winner Mike Cameron, the Brewer defense would be even more offensive. And even if they get all of that straightened out, Ned Yost is still in charge. He's overdue to make a silly decision. Like keeping Yoavani Gallardo in a game where he tears his ACL. Or using a suicide squeeze with the bases loaded. Or head-hunting against a team that's out of it while you're in a pennant race. Look, the NL Central is far from being decided. But if the Brewers can't get their act together, Wisconsinites will be turning to FOX NFL Sunday sooner rather than later.